If there was ever a perfect time to do something nice for yourself, it’s the beginning of a brand new year! 2019 just got started, and instead of sticking with the same old New Year’s resolutions, why not enhance your smile instead? You might think of cosmetic dental procedures as just a luxury, but feeling good about your smile is a hugely important part of your overall quality of life. 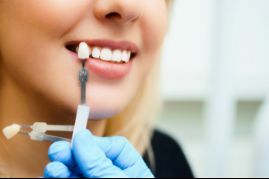 So if you’ve spent years covering your teeth when you smile, keep reading to learn about the procedures a cosmetic dentist in Hutchinson can do to transform your smile and why they’re faster and easier than you might expect! Whitening is one of the most popular cosmetic procedures for a reason: It makes a big difference in your smile for a relatively small investment of time and money. The strength of over-the-counter products from the store are limited by the FDA, but a dentist may recommend this option if your goal is to be just 1-2 shades whiter. If you prefer to whiten more gradually, a take-home option will work great and will brighten your smile by 6-10 shades. This involves wearing custom-made trays that you’ve filled with a professional-strength whitening gel. Most people get their final results in 10-14 days (wearing them for 30-60 minutes a day). If you have an event coming up soon or simply want your results immediately, a 1-hour, in-office procedure is your best bet and will whiten your teeth by 6-10 shades. Using clear brackets and tooth-colored wires, 6-Month Smiles is a fantastic way to discreetly straighten your teeth fast. It works best for patients with mild to moderate alignment issues, and most people are done in just 5-8 months! If you’re interested in finally getting the smile you’ve always wanted in 2019, the first step is to schedule a consultation with a cosmetic dentist in Hutchinson. Some people only need one procedure such as whitening to achieve their goals. Others may do better with a combination of procedures. Either way, you’ll be one step closer to a smile you can feel proud of! Dr. Melissa C. Barnhart is a general, restorative and cosmetic dentist in Hutchinson who combines the art and science of dentistry to deliver outstanding cosmetic results. She always starts with a thorough consultation to understand her patients’ goals and works with them from start to finish to make sure they get the smile they want. If you’d like to enhance your smile and have any other questions, she can be reached via her website or at (620) 669-0835.